The first time I visited Italy I was nineteen years old, on my first solo trip abroad full of traditional food and cheap wine. The last time I visited was fleeting, as a relaxing break between road trips. 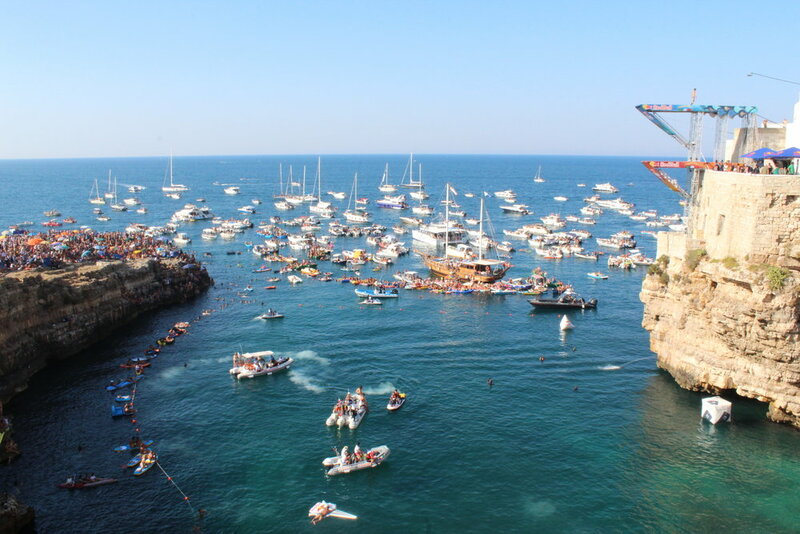 So for my third visit, I ignored the tourist hotspots of Rome and Venice and headed to the tiny town of Polignano a Mare, just out from Bari to watch the annual Red Bull Cliff Diving Championships. I had heard little of either the region or the sport, so was eager to go into both with everything to find out. The Red Bull Cliff Diving Championships has only existed since 2004, so it is still very much in its infancy. It has grown ever since, attracting tens of thousands of people in countries all across the globe. 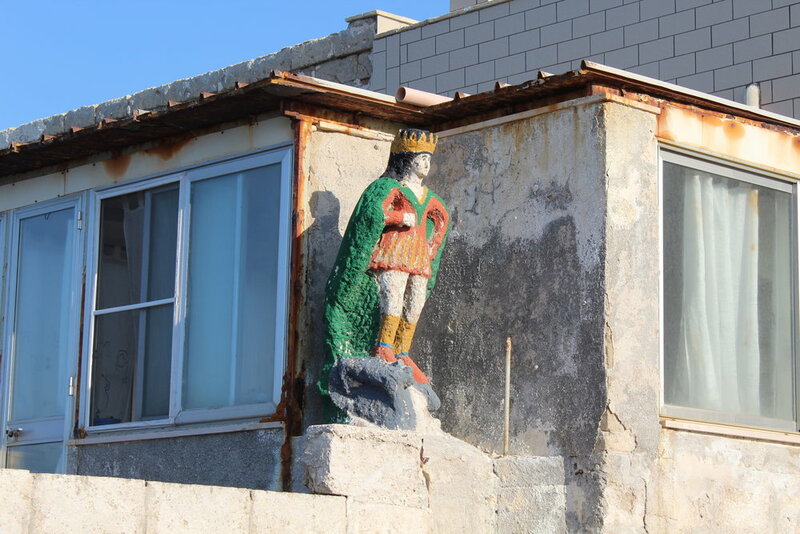 Yet in this tiny region, the thousands of revellers were mainly local, meaning a refreshing lack of external tourism. That reflects also onto the quaint town centre, that hasn't quite hit unlike Rome and Venice and the overpopulation tourism has brought. The championships are fantastic to watch, as the experienced divers fit in as many twists and turns than thought possible in the few seconds they glide through the air before landing in the water with a strong cracking noise. The 27m jump brings a multitude of injuries as their bodies hit the water unless they fall exactly right. I even ended up doing some cliff diving of my own from the local cliff edge although my 10m jump, whilst scary enough, was measly in comparison. 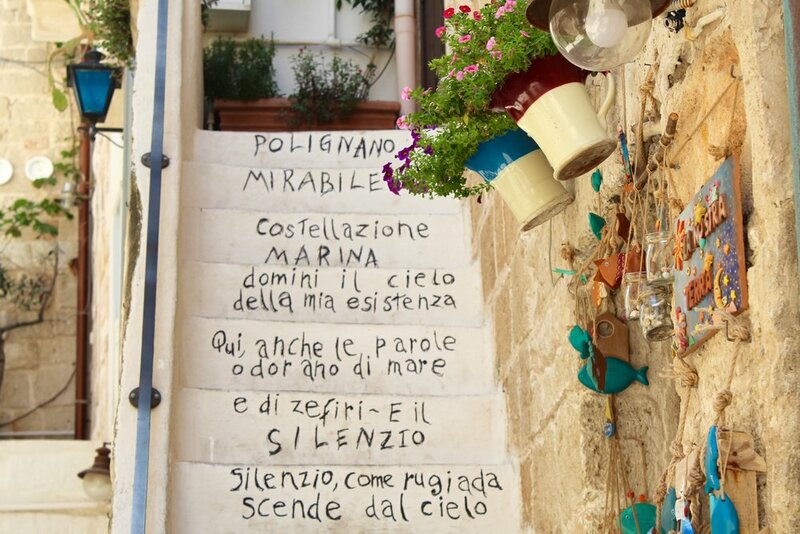 Yet the small town of Polignano a Mare was perfect to spend a few evenings exploring. The winding alleyways were full of brightly coloured shutters and exuberate pink flowers climbing up any surface they could find, with the smell of olives permeating the air. Every cafe came with Red Bull cocktails, as street performers played a bizarre mix of music throughout and street performers were few and far between. The shops selling olive oil, something the region is famed for as well as brightly painted ceramics, real leather sandals on the walls and book sharing boxes scattered throughout, meant somehow the small streets still led you somewhere new every time as the sun peeked through the tall buildings. A dinner at Neuro came with the largest and creamiest buffalo mozzarella which oozed as it was sliced through, on a plate of Parma ham that went on for days and was deliciously rich and salty. Even an additional steak in wine-infused sauces and one of the best chocolate souffles chased with wine couldn't touch the first part of the meal. So good, in fact, that it warranted a swift return the following day for the same meal. Beluga restaurant also cannot be forgotten, with almond crusted prawns, mushroom pate and goats cheese with a heavenly heavy expresso to end. Of course, what is an Italian visit without gelato? Bar Riviera in the heart of the square (and where the championships after party takes place) slaps on the joyously creamy gelato with Nutella and dark chocolate the best choice, all for a couple of euros as the queue snakes out of the door. Ending every day was spent watching the sun collapse onto the sea, as the pink that can only come from a beautiful day to end on a beautiful night can be. Each cliff edge offered a unique view, although of course the most unique came from the numerous boats and jetties that effortlessly bobbed about on the water, watching the light slowly sneak behind the buildings before settling down for the night. Polignano a Mare was nothing that I expected in the best way possible. A day of thrill seeking and pumping music as the divers jump, to the calming evenings with fine food and sunsets drifting the day away as the sun is pinker than your nose is from the blaring heat.